I found your post on Facebook, followed it here, and will go and look at the hack pad. I’m not sure if you also posted this on Google plus. You’ve demonstrated a tremendous degree of commitment to the community by mapping this single conversation and tried to inspire others to think about it. Of the 225 members on the FB group, I wonder how many will find the time to read it, make the time to think about what you’re writing, and then take the time to respond, in your blog, on FB, and in the Hackpad. I suspect it will be very few. I love the way you mapped this conversation. You’ve seen my maps, and how passionate I am about them. Yet, I face the same challenge that too few people are actually taking the time to read them, think about them, and then share them with others. I spend a lot of time asking “what can I do to change this?” and “Is there any reason to continue to try?” The answer to the first question is to continue to engage. The answer to the second is “If not me, then who?”. 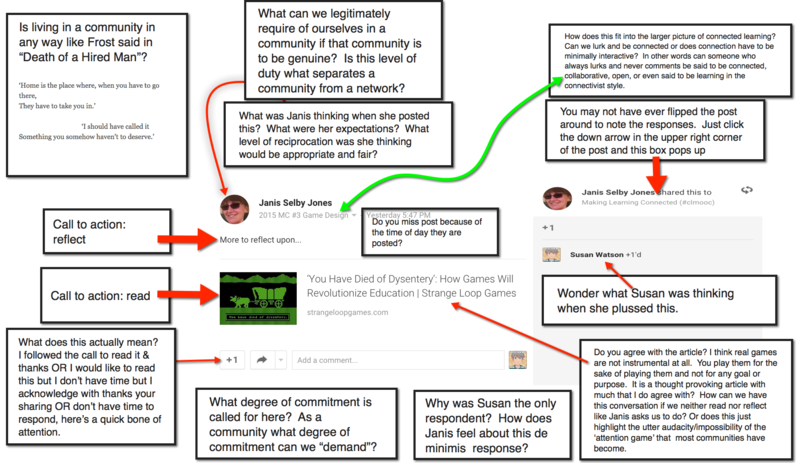 One thing that is interesting is that I am planning to use online community (maybe CLMOOC, maybe one of the others I work in, maybe an abstracted version of all of the above) as my system to deconstruct or whatever this week. Maybe we can play with that together. I also have a post in draft about the whole “leaderless” thing and will look forward to your thoughts on that too. I am happy to work with you anytime, Karen. Are you thinking of using an analytic tool of some kind to do the deconstruction. Unpack this for me because it sounds intriguing and I want help if I can. Honestly I have no idea. My first thought was to map out (paper and pencil sketch) of a community “system” (inputs, outputs, ??). Maybe I’ll try something and then share for your thoughts and iterations. maybe paper wireframe an ideal open replacement for all this that we are doing on the various platforms, just thinking out loud here. I have an idea that might be junk, but it is funky and I will send something tomorrow morning.